As you may already know, books from The Operating System are unique in that they offer you a look behind the curtain – at the practice of the creative person (or persons) whose work you’re holding in your hands, at the context within which that work evolved and came to be made. In celebration of our recent publication of his first book in over a decade, How to Survive the Coming Collapse of Civilization (and Other Helpful Hints), I wanted to share with you here a rare peek into Sparrow’s operating system, so to speak, included in the book’s back matter. Want more Sparrow? He’s giving a workshop on The Minimalist Poem (of which he is a Master) at Bowery Poetry at 5:30 on Monday, 5/23, after which he will be a featured performer at the Open Mic. My name is Sparrow, though it’s not my legal name. I took on this Native American-sounding pseudonym in 1975; my friend Jennifer The Princess of Love gleefully supplied it. Since then I have clung to “Sparrow” with tenacious loyalty. Most of what I publish – what I get paid for – is prose. My mentor Ted Berrigan advised me to stop writing poems, and to write non-poetry. He was a little vague about exactly what I should write. When someone at a party asks me my job, I reply, “I’m a local journalist” – because once a month I write real cultural journalism for Chronogram, a magazine published in Kingston, New York. (I live in the Catskill Mountains, 23 miles from Kingston.) I get $120 for each article. Right now I’m writing about a show at the Katonah Museum of Art, which may be the first art show in history with actual bird nests next to human works of art. I do meditation twice a day, and my “writing” directly emerges from the daydreaming I do while meditating. My essays are collections of interior distractions. Fighting to change the world is much more valuable than composing paragraphs or poems. I have been a rather uninspired “activist” for decades. Every four years, I run for President of the United States. It happens that I am running at this moment. But don’t vote for me! I don’t want votes. I want something greater than votes: I want broken balloons, twisted together. A poet is a woman or man with extraordinary powers of listening. Often a poet can hear a dog fart 130 feet away. A poet’s purpose is to internally transform the few hundred people on earth who take poetry seriously. Also, knowing that the world still has poets in it consoles almost everyone. It proves that we are not yet automatons. Reading is a private experience, as private as prayer. Poets – unless they are shouting on streetcorners – communicate in this secret, ethical way. I have very little sense of my own social role. Most of my writings appear in The Sun magazine, which has a circulation of 70,000. My sense is: certain subscribers read me and laugh; others despise me & think I’m a preening showoff (which perhaps I am); a few, maybe no more than 12, consider me a guru. There are three sections to this book: a self-help guide to surviving the coming collapse of civilization, a series of one-word poems, and a bunch of quotations from famous people that I faked (in other words, I wrote them all). Each of these series began small – with a single item, in the latter two cases – but after a while, my habit of accumulation took over. I’ve been writing the one-word poems for 17 years, the quotations for 15 years. (These are approximations.) How to Survive the Coming Collapse of Civilization took three years to compose. I never really expected to publish any of these manuscripts. I’m so used to being unpublished (and having my manuscripts excerpted in The Sun), I worry that it’s a mistake to transform these Mental Conceptions into physical books. The title How to Survive the Coming Collapse of Civilization came very early – perhaps before I even started writing. I knew that the world would end in 2012, because the Mayans had prophesied it, and the Mayans are generally correct. I thought I would “cash in” on the extinction of the current system with an all-purpose guide. The second part of the title (And Other Helpful Hints) seemed logical when I added the other two sections. I am fascinated by usefulness in writing. My old friend Sheila Alson often asked: “What is the use-value of poetry?” Years later – after Sheila’s death – I realized that she’d stolen this phrase from Karl Marx. I intend for this book to have use-value, to help revolutionaries & others in distress. Of course, this book is also a “joke.” It’s one of the few books that is both frivolous and utterly sincere. I write all my books for nihilistic teenagers in Ohio (and their grandmothers). I want titles that will tickle them – and also seduce them. Hopefully several teenagers will steal How to Survive the Coming Collapse of Civilization from bookstores in Columbus. Self-help books fascinate me, though I’ve never read one all the way through. I love their all-knowing tone, the sense of subtle deception that is so American. I like giving my readers commands. The three sections of my book arose from the Slow Method: living a quiet life in the deep country, pursuing my daily practices, gradually accruing sentences and paragraphs. I am 62; I can remember back 58 years, to 1957. I am happy to be a guy who can spend 17 years writing 1/9 of a book. Socialism and anarchism must be continually reinvented, the way Christianity must be always reborn. I want to produce an artifact that looks like a jokebook – partly because it is a jokebook – but that also transforms lost Ohioan kids into dangerous visionaries. These kids, who take heroin, sniff glue, skateboard, listen to “noise sonatas,” wield tremendous power, once they turn from self-destruction to luminous revolution. Another influence: Kendrick Lamar. The greatest writers in America now are producing rap CDs & comic books. The “book” is basically dead. 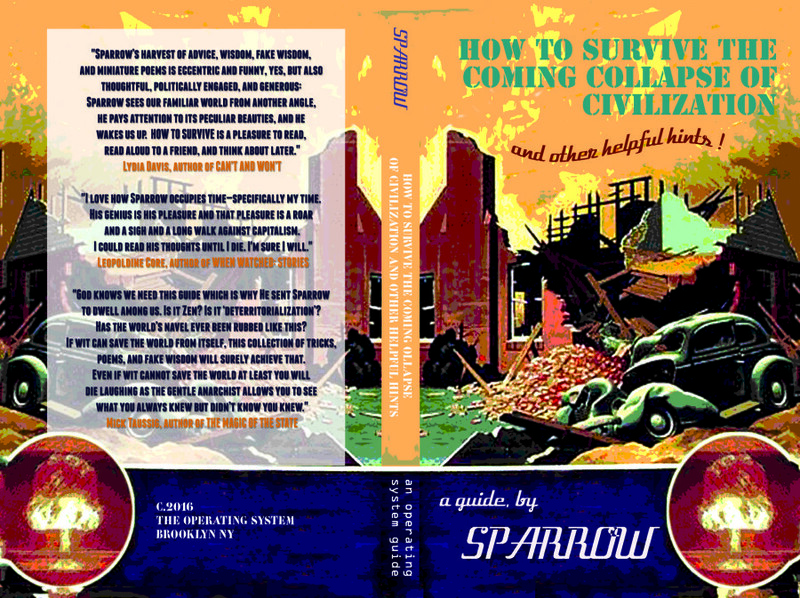 How to Survive the Coming Collapse of Civilization (And Other Helpful Hints) is a rap song plus a comic book – without the music & pictures. My God, I forgot Yoko Ono! She is the direct progenitor of my self-help writings. Plus the speeches of Malcolm X.
I studied with a number of great poets: Ted Berrigan, Allen Ginsberg, Philip Whalen, Alice Notley, Philip Levine – plus the prose writer William Burroughs. From them I learned that poetry is not an achievement like winning a silver medal in the Olympics; it’s a series of lonely beginnings. Poetry is the beginningest artform. A geographer or a painter draws on her previous accomplishments; a poet begins each poem homeless and headless. Sparrow was born in 1953 in Lenox Hill Hospital, in Manhattan. He grew up in a housing project in Inwood, graduated from the Bronx High School of Science, flunked out of Cornell University, became a hippie, studied at the Naropa Institute in 1976 with Allen Ginsberg, Philip Whalen & William Burroughs, published his first book of poems in 1978 (Sparrow’s Poetry Coloring Book, entirely hand-drawn, xeroxed surreptitiously at a copy shop) returned to New York City (still in 1978), finished college, began graduate school at CCNY (studying with Ted Berrigan). Soft Skull Press published three of his books: Republican Like Me (about running for President of the United States in 1996), Yes, You ARE a Revolutionary! & America: A Prophecy – The Sparrow Reader. Sparrow is the longest-running contributor to The Sun magazine, beginning in 1981. He has been published in the New Yorker, the New York Times (five poems & three op-ed pieces), the American Poetry Review, Lungfull! (plus other magazines) – and was quoted in Vogue. Sparrow plays flutophone in the “New Crimean” pop band Foamola. 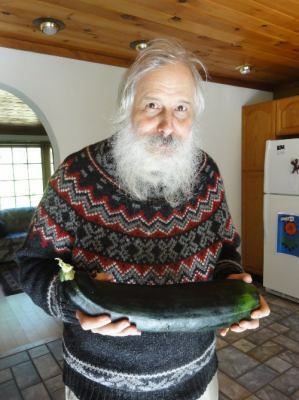 He now lives in a doublewide trailer in Phoenicia, New York with his wife Violet Snow.